As we're deep into the term, there's no better time to make sure your students have got to grips with their learning. 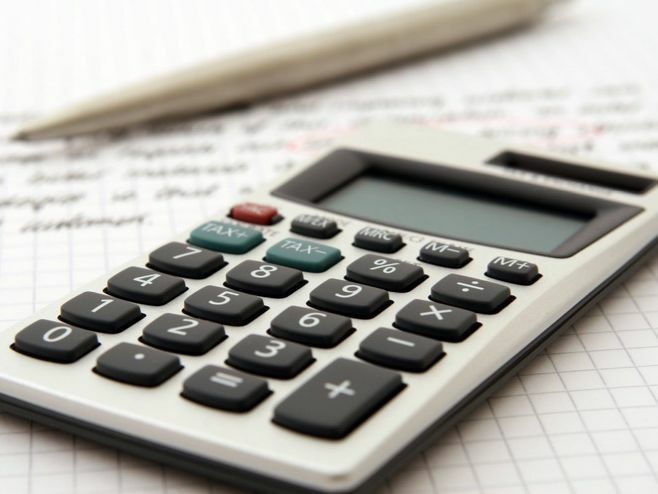 From unit tests to writing tasks, we’ve picked out a selection of assessment tools to help both you and your students track progress so far. This is a post-test activity which could work with any test (end of topic, end of term, end of year). I was finding that some students weren't inclined to read over their marked test papers and learn from them. This activity turned post-test analysis into a game, and students became much more active in looking through their papers and learning from them. You could easily change the questions to suit your group. I'd say it's better for KS3 but could be used at KS4 too. AFL activity. Short tests, with the answers included, that can be used before the teaching of a topic. Could be used as a starter. Some KS3 SAT questions have been used. Worksheet with questions to allow progression in drawing graphs. Printable stickers with levels + descriptors for students to peer/self assessment. Level 7 is missed off the stickers. It is adding error bars and using the graph to make predictions. Questions for students to assess themselves on and track their progress in order to be able to recall key facts in their exams. Students cover the answers and tick in the record table if they get it correct. Repeating this activity will help them to consolidate facts and track their progress with revision. Ideally printed as A5 booklets. 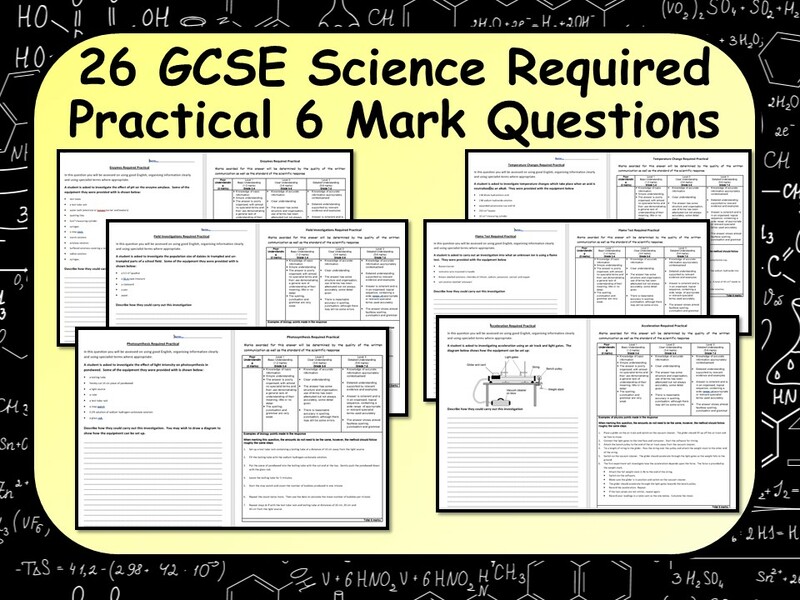 This resource is a set of 26 bespoke 6 mark questions to test students understanding of most of the required practicals in the 2015 AQA Science specification. The questions have been written in a similar style to the practical 6 mark questions in the sample material. If, like I was, you are fed up with analysing data manually, this spreadsheet is for you. 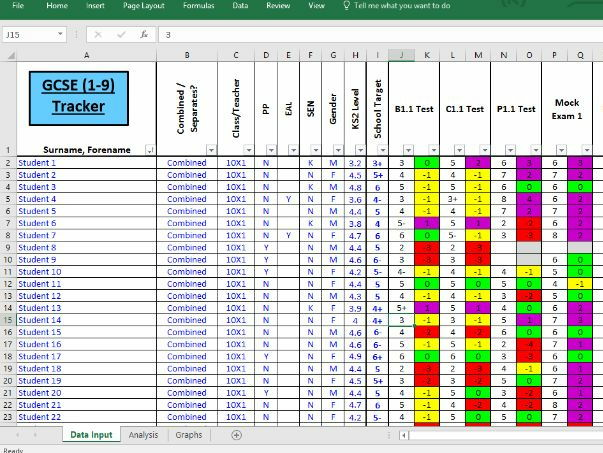 Originally created for my science department and then rolled out whole-school, this GCSE progress tracking spreadsheet will save you hours of analysing, putting relevant data right at your fingertips within seconds of assessments being graded. - progress & attainment of SEND vs non-SEND, Pupil premium vs non Pupil Premium and EAL vs non EAL. You can filter each column and the analysis table and graphs will automatically update. For example, perhaps you want to look at how pupil premium boys with low prior attainment are performing in your subject? Colleagues have used it with great success in department meetings, leadership meetings, appraisal meetings, performance management and even with inspectors. Only the white cells are editable, the others are locked and the sheets are password protected (password will be supplied) to avoid any accidental changes to the formulae. I give these out at the end of each topic and also before holidays for exam preparation. 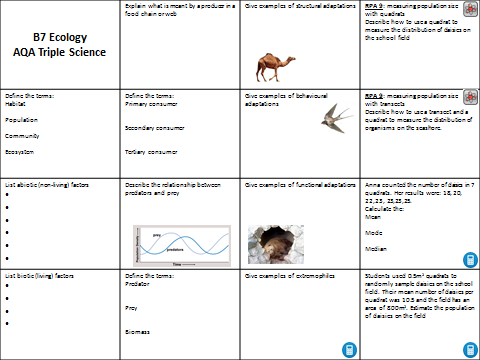 A set of writing tasks covering the content of AQA Physics A. Each has a PIN mark scheme so they can also be peer or self marked. These missing word documents are designed to be copy and pasted into the Edmodo missing word quiz template. Though they can also be used as straight forward worksheets. www.edmodo.com is a free social network sight that I use in place of a VLE. Very user friendly and the kids love it. Feedback form to cover the CPAC A-level required practicals in Biology, Chemistry and Physics. Pupils can comment on areas for improvement and target what they will do in the next practical. The 5 assessed areas are included on the 2nd page. This is a very useful and comprehensive resource for students studying A level Biology. A great refresher for the teacher too or someone teaching Biology who may not be so confident when it comes to teaching statistics. The resource is a 22 page booklet which covers all the key aspects of statistics required for Biology at A level. There are worked examples and questions for the students to work through. This booklet has been designed to be fully explanatory so that students can work through it independently. The booklet is fully comprehensive and no other resources are needed; all probability tables are given with the questions. The booklet should take approximately two 1 hour lessons to complete, dependent on how familiar the students are with statistics. Those studying A level Maths and Geography may be more confident working through the calculations and understanding the outcomes. A separate answer booklet is provided with answers to all questions given.